and has lights and two electric sockets, table and benches. The Pod is camping without the hassle of pitching a tent. Warm, waterproof and cosy. camping beds or an inflatable mattress is a good idea. Your usual camping bits are needed but not your tent. The Pod is secure with its own key so all your belongings are safe. Outside has a small decking area ideal for relaxing on your camping chairs or deck chairs. 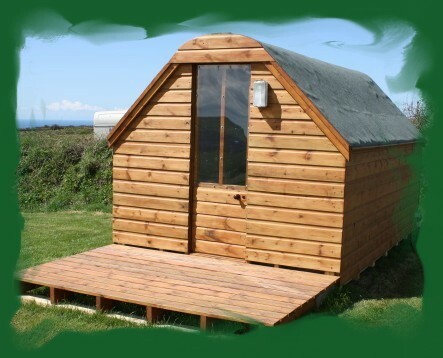 The Pod has wide uninterrupted countryside and sea views. PRICE: £25 per night for one adult (including electric) plus £8.00 for second adult, £4.00 for child. Sleeps 2. Weekends minimum 2 night stay.